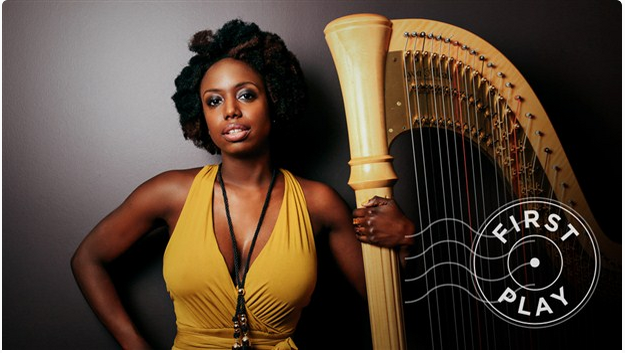 Brandee Younger is an accomplished harpist who balances her classically trained background with an eye on contemporary music. This approach is borne out on Wax and Wane, Younger’s sophomore album that balances the New York native’s reverence for the past with progressive jazz sounds. Inspired by harpists such as Alice Coltrane and Dorothy Ashby and their forays into jazz, Younger uses their experimental approaches as a foundation for her own music. Ashby, with her seamless meshing of the harp to full bands and funky percussion is a particular inspiration. Ashby appeared on classic recordings like Stevie Wonder’s Songs in the Key of Life, Minnie Riperton’s Adventures in Paradise and Bobby Womack’s The Poet, and Younger covers Ashby’s ahead-of-its-time 1968 track “Afro Harping” from her album of the same name on Wax and Wane. In fact, “Wax and Wane” is the name of an Ashby track. Younger herself has also played with noted jazz instrumentalists Ravi Coltrane and Kenny Garrett among many others as well as on tracks by artists like Common and Toronto hip-hop artist Drake. Accompanied by flutist Anne Drummond and members of Younger’s quartet including saxophonist Chelsea Baratz and bassist Dezron Douglas, Wax and Wane also features Dana Hawkins (drums) and Mark Whitfield (guitar), while the swelling interludes feature string duo Chargaux. Produced by multi-instrumentalist Casey Benjamin, a fixture in the Grammy-winning Robert Glasper Experiment band, Wax and Wanefirmly situates Younger’s shrewdly deployed celestial glissandos and nimble improvisation in sync with a crew of crack musicians, expertly balancing instinctive groove and finely honed virtuosity. Wax and Wane will be released on Feb. 19 on Revive Music. Pre-order the album here.